LED sources are rapidly gaining in popularity in the UV-cured coatings market as they offer reduced cost, longer life and environmentally-friendly alternatives to conventional lamps. Transitioning to UV LED, however, often requires more than just a simple equipment change. Modifications to the chemistry also might be needed to effectively compensate for the lower energy levels and narrower wavelength range. This is particularly true in coatings applications, where oxygen inhibition can have a detrimental effect on cure properties1. In this paper, we will examine how proper photoinitiator selection and concentration can be used to optimize the performance of LED-cured coatings. modifying the coating chemistry/photoinitiator package. Isolating the coating from the atmosphere is the most straightforward method of mitigating oxygen inhibition, but it also is the most difficult  particularly when curing large areas. Applicators have attempted to reduce the oxygen exposure by blanketing the exposed area with inert gas or covering with waxes and films. This approach works well in laboratory settings but can be impractical for large, industrial applications. Increased energy is another way of improving curing of coatings under UV LED. Upon inception, LED lamps were limited in the amount of energy they could produce, but as the technology evolved, higher energy lamps capable of producing more free radicals and faster cure speeds were developed. While this significantly improves surface cure, the higher rate of polymerization can have a detrimental effect on depth of cure, depending on the photoinitiator package the formulator has chosen. This is particularly true with thicker coatings, where the poor depth of cure can lead to poor coating performance in the field. Similarly, increasing the concentration of photoinitiator in the coating allows for more free radical formation, which, in turn, provides for better through-cure. Depending on the type of photoinitiator chosen, this approach can have a detrimental effect on depth of cure, as well as obvious economic implications. Care also should be taken that the concentration of free radicals produced does not exceed available sites, as this could result in a reduction of cure speed. One variable that has yet to be completely explored is the effect of the type of photoinitiator used in the formulation. Formulators frequently use combinations that have succeeded in the past, but photoinitiator performance under conventional UV lamps is not necessarily indicative of how it will do under UV LEDs. In some cases, particularly thick coating applications, entirely new combinations that work using a completely different mechanism can produce significantly better results. In this paper, we will evaluate not only how the concentration of photoinitiators can affect coating performance but, more importantly, why the choice of material also is critical. To determine how photoinitiator selection and concentration affect cure performance, it is important to understand first how photopolymerization works. The process begins with a molecule being exposed to radiation, creating a reactive species resulting in photopolymerization of monomers. The two most common types used in coatings are free-radical photoinitiators, used to polymerize acrylate-based monomers, and cationic photoinitiators, used in epoxy-based formulations. In this paper, we will focus only on acrylate-based systems. Upon light absorption, a photoinitiator transitions from the neutral ground state to an electronically excited singlet state. Once in the singlet state, a rapid intersystem crossing occurs to form the excited triplet state, which is where radical production most often results4 (Figure 1). The exact mechanism of radical formation can vary, depending on the molecules chemical configuration. A (substituted) alkyl group at the R1 (as is the case with acyl-phosphine oxide) undergoes a Type I scission, producing two radical species with different reactivity and oxygen sensitivity characteristics5 (Figure 2). Hexaarylbiimidazole, or HABI as it is more commonly known, utilizes a different mechanism to produce free radicals and initiate polymerization. Upon exposure to UV radiation, the HABI molecule is activated to form an excited intermediate compound. Radicals then are produced by hydrogen abstraction or electron extraction from a second compound in the formulation. The secondary compound then becomes the initiating radical, resulting in polymerization (Figure 3). Numerous HABIs are possible by modifying the substituent groups R attached to the aryl groups of the molecule. For example, the structure is called a lophine dimer when R is hydrogen. However, when chlorine replaces hydrogen, the compound now is called o-Cl-HABI. The addition of the Cl changes the physical properties and performance of the molecule. Hundreds of HABIs can be synthesized by the addition of functional groups to various and/or multiple positions on the aryl groups. Each may exhibit different physical properties and performance. The performance of each material, however, is system- and application-dependent (Figure 4). Reaction mechanism is only one consideration when choosing a photoinitiator. Solubility, color, photo speed and cost all play important roles. Researchers also rely on a compounds UV spectra to determine the suitability of material for the specific application (Figure 5). Recently, much attention has been given to optimizing photoinitiator packages for LED applications. In the next section, we will explore how photoinitiator selection affects the curing properties of both thick and thin coatings under UV LED. The diluting monomer was added to improve the solubility of the photoinitiator package, as well as to facilitate coating drawdown. In all cases, the diluting monomer used was n,n-dimethyl acrylamide (DMA), a nonionic acrylic monomer. DMA also was chosen as the nitrogen atom, positioned on the backbone to facilitate curing in the presence of oxygen. The photoinitiators chosen for this study were selected from the either the imidazole family (Hampford Research) or phosphine oxides (BASF). In all cases, the substituted thioxanthone co-initiator chosen was 2,4-Diethylthioxanthone (DETX), and the electron donor used was 2-Mercaptobenzoxazole (2 MBO). Testing was performed using a series of 0.8-mil wet film drawdowns on 0.010-inch aluminum plates. The coated aluminum plates were irradiated using a Phoseon Starfire Max LED lamp at 395 nm wavelength. The line speed was maintained at 12 feet per minute throughout the experiment. After each pass, the panels were removed and the degree of surface cure evaluated per a set scale (Table 1). The first formulation tested used EO-TMPTA (Ethoxylated TMPTA) as the main monomer. This material is commonly used in acrylic coating formulations due to its low toxicity and fast cure speed. Both the imidazole-based and phosphine oxide photoinitiator packages dissolved readily into the diluting monomer, and the resulting solution added to the TMPTA. The coating material was applied to an aluminum plate and cured under UV lamp (as detailed previously). Both the imidazole-based, as well as the acyl-phosphine oxide system, showed little surface cure after the first pass and comparable results through four passes. After the fifth and final pass, the imidazole-initiated coating was completely cured while the PO coating still could be scratched (Figure 6). The same tests were performed, this time substituting Isobornyl acrylate for the main monomer. IBOA is commonly used for coatings due to its hardness and flexibility characteristics. It is somewhat less reactive than the TMPTA, which was demonstrated, as neither formulation achieved full cure even after five passes. The phosphine oxide-initiated system did show a slight advantage in surface cure after the second and fourth pass (Figure 7). Sartomers CN-131B was the primary acrylate for the third and final series of surface cure tests. This particular aromatic monoacrylate oligomer also was chosen due to its high reactivity and fast cure speed. As expected, both photoinitiator technologies exhibited full surface cure after only one pass (Figure 8). While there were some slight differences in surface cure characteristics (the imidazole-based being slightly more cured), the two photoinitiator systems gave very similar performances. Repeating this same series of tests substituting a traditional mercury lamp, all of the formulations tested demonstrated full cure by the second pass. This clearly illustrates the challenges associated with oxygen inhibition under LED lamps normally not seen with mercury lamps. The relationship between surface cure and depth of cure is complex and not always completely understood. Normally, one would expect good surface cure to be an indication of complete through cure as well. While this is the case with conventional lamps, the opposite can occur with LED systems. Additionally, modifications that intuitively would help (i.e. higher photoinitiator concentration) actually can reduce the depth of cure. In the next series of tests, we evaluated how photoinitiators affect the depth of cure in both LED- and conventionally cured coatings. To evaluate how photoinitiator selection and concentration affect through cure, we started with a standard coating formulation composed of equal parts CN-964, IBOA and CN-131B. Two photoinitiators were chosen from the acyl phosphine oxide class, as well as two from the imidazole family. For this series of tests, the photoinitiator concentration ranged from 0.5 percent to 2 percent by weight. As before, 2-Mercaptobenzoxazole was added to all test solutions as an electron donor. Exactly 0.5 gram of each formulation was weighed out into a ceramic Coors evaporating dish and irradiated under UV LED (395 nm) for a single pass at 72 feet per minute. The cured coating was removed (Figure 9), and the thickness was measured to the nearest 0.001″ using a micrometer (Figure 10). Table 2 details the results obtained from the second series of tests. As was the case with the first series of tests, complete cure was achieved in all cases. When exposed to UV LED, there was anywhere from a two percent reduction in through cure (Solution #1) to as much as an 86 percent reduction (Solution #4). Although the mechanism is not completely understood, it has been proposed that achieving a high rate of surface cure is actually detrimental to depth of cure, as it prevents radiation to reach deep into the coating. It also appears that smaller, more mobile photoinitiators  as found in solutions #1 and #3  performed better than their larger, bulkier counterparts. 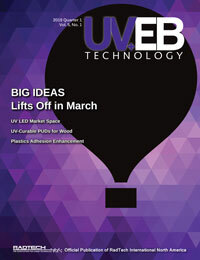 Overall, solution #1 should offer the best overall performance under UV LED. The transition from broad spectra mercury lamps to lower cost, more environmentally-friendly LEDs represents one of the most important changes in recent UV/EB technology. However, formulators face significant challenges in maintaining coating performance within the limited wavelengths these lamps produce. Poor surface cure due to oxygen inhibition is one of the more common challenges applicators face when converting to LED. This can be mitigated a number of different ways, either by isolating the coating from the environment, or through modification of the chemistry itself (both monomers as well as photoinitiators). Incomplete through cure is another problem related to UV LED. It generally occurs when insufficient energy is produced to pass through the cured surface and seems to worsen as its concentration is increased. As LED lamps become more and more popular in mainstream coating applications, formulators will continue to find ways to optimize overall coating performance. Michael Wyrostek is the director of sales and marketing for Hampford Research. He is a graduate of the University of Massachusetts with a bachelors degree in chemistry. Wyrostek has worked in the specialty chemical business for over 30 years, holding positions in research, sales, marketing and product management. For more information, email mwyrostek@hampfordresearch.com or visit www.hampfordresearch.com.